Market Melt-Up - What Does It Mean? What is a "market melt-up"? What is the definition of a "market melt up"? You can probably guess that a "melt-up" is the opposite of a "meltdown". When the market "melts down", major market indexes tank. This is usually triggered by some sort of geopolitical event (the start of a war, terrorist attack, etc) or the beginning of an economic downturn (recession, depression). In a "market meltdown", major indexes (such as the DJIA and NASDAQ) in the United States), may fall anywhere from 10-50%. 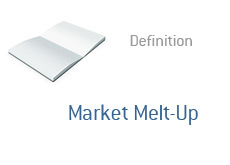 A "melt up" is the exact opposite - a "melt up" occurs when the markets suddenly explode higher. 2. Strong earnings reports from prominent companies. In a market "meltdown", investors look for any reason to sell. The attitude is "sell first, think later". In a market "melt up", investors are buying first and thinking later. Market melt ups can result in increases of anywhere from 20 to 100%+ for the major market indexes.